Borromeo, an actor, singer and dancer, is a host of “Sunny Side Up Show” on Sprout (NBCUniversal), the first 24-hour preschool destination available on TV, on demand and online. Along with her co-host, Chica, Borromeo interacts live with preschoolers and their families across the country as she shares daily birthday greetings, viewer-submitted crafts, fun facts and weekly themes ranging from colors, numbers and letters to manners, gardening and pets. Borromeo debuted as a host on “Sunny Side Up” in June 2014. 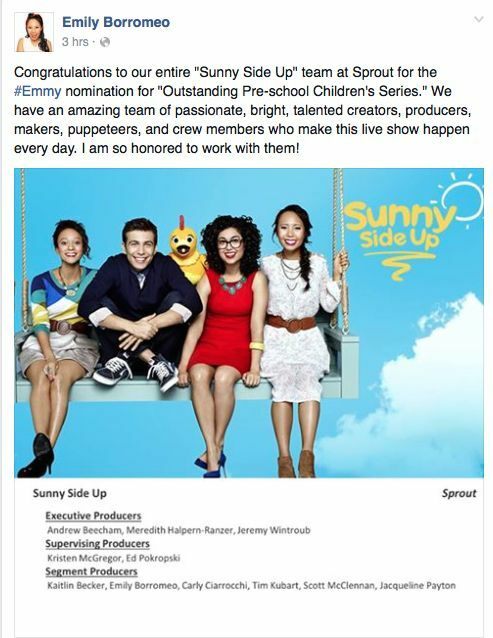 “Sunny Side Up” airs Monday – Friday 9 a.m.-noon ET. Along with Borromeo and Chica, “Sunny Side Up,” stars Carly Ciarrocchi, Kaitlin Becker and Tim Kubart. The show is co-executive produced by Andrew Beecham, Meredith Halpern-Ranzer and Jeremy Wintroub; with supervising producers Ed Pokropski, Kristen McGregor, and features music by Tim Burns. The series is produced by Sprout and is part of Children’s Network LLC, a division of NBCUniversal. 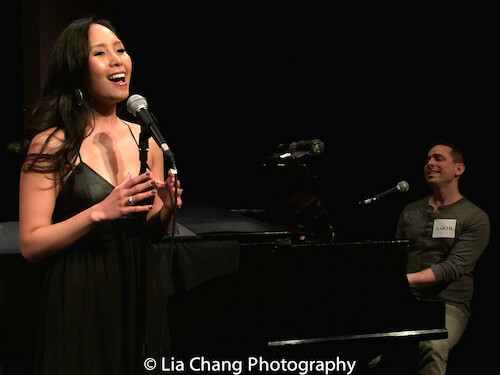 Originally from Los Altos, California, Borromeo has been singing since the age of three when her favorite movies included The Wizard of Oz and Singing in the Rain. Since then, Borromeo has gone on to become a lead soloist on NBC’s a cappella competition, “The Sing Off,” and perform in many off Broadway shows and new musicals. Borromeo is also a member of America’s Sweethearts, a vintage music entertainment group. From May 6 – May 28, you can catch Borromeo as Marcy Park in The Astoria Performing Arts Center (APAC) production of the award-winning musical THE 25TH ANNUAL PUTNAM COUNTY SPELLING BEE, directed by APAC Artistic Director Dev Bondarin. Click here for more information. 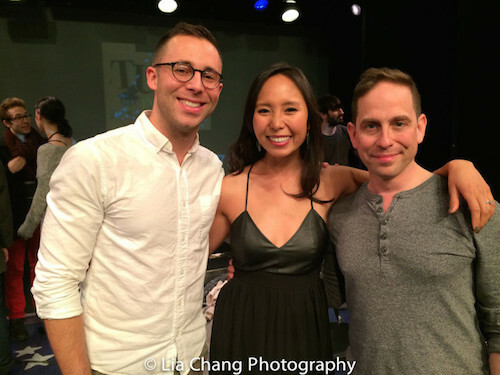 Borromeo recently came out to support her pals lyricist Benjamin Halstead and composer Garth Kravits at the TUNE IN TIME Musical Theater Game Show at the York Theatre, when Halstead and Kravits were paired together to create an original song in 20 minutes for a new musical, and ultimately won. Borromeo performed a duet with Garth Kravits of his new original song “That Man” from M: The Musical. 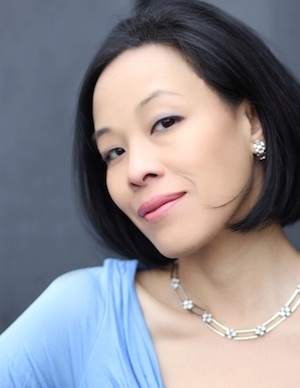 In addition to being a host on “Sunny Side Up,” Borromeo’s love of working with kids and her passion for the arts have led her to volunteer as an actor and teaching assistant for “Story Pirates,” a non-profit arts organization that promotes creative writing skills, confident self-expression, and literacy to kids of all ages. Borromeo graduated from Brown University, where she earned a B.A. in Entrepreneurship and Organizational Studies. The Daytime Emmy Awards ceremony is set for May 1 at the Westin Bonaventure hotel in downtown Los Angeles. The Creative Arts kudos will be handed out April 29 at the Bonaventure. The 43rd Annual Daytime Emmy Award Nominations were announced on the Emmy-winning show, “The Talk,” on CBS. A full list of all nominees in all categories can be downloaded at www.emmyonline.tv. The National Academy of Television Arts & Sciences (NATAS) is a professional service organization dedicated to the advancement of the arts and sciences of television and the promotion of creative leadership for artistic, educational and technical achievements within the television industry. It recognizes excellence in television with the coveted Emmy® Award for News & Documentary, Sports, Daytime Entertainment, Daytime Creative Arts & Entertainment, Public & Community Service, and Technology & Engineering. NATAS membership consists of more than 15,000 broadcast and media professionals represented in 19 regional chapters across the country. Beyond awards, NATAS has extensive educational programs including Regional Student Television and its Student Award for Excellence for outstanding journalistic work by high school students, as well as scholarships, publications, and major activities for both industry professionals and the viewing public.